Indonesia is the biggest country in South East Asia – with over 17,000 islands, stretching from 100 km south of Nicobar Islands in the Bay of Bengal, to near Darwin Australia. It has over three time zones, thirtythree provinces and hundreds of languages and dialects. It is also the fourth most populous country in the world. I would highly recommend visiting Indonesia. (Unfortunately, at present there are no direct flights from India to Jakarta – Hope that they do commence direct flights soon! For now, connections through Singapore, Kuala Lumpur or Bangkok are quite convenient). Tourists from many countries may be eligible for visa on arrival. Combining Jakarta, Bandung and Bali in your itinerary would require a week (at minimum). Given our time constraints, we decided to leave Bali out for our next trip. 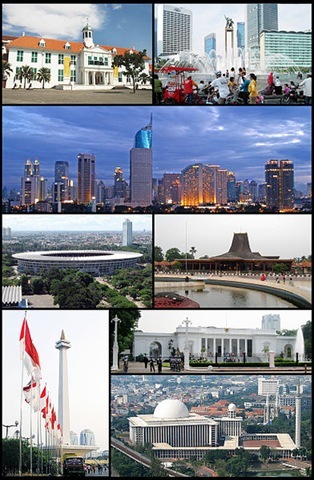 Jakarta is the capital (as well as the commercial capital) of Indonesia. It is a large, vibrant, cosmopolitan metropolis with over 14 million people. Like many large developing world cities, it exhibits quite a few contrasts – from first world like road infrastructure, downtown area, malls – to shanty towns and slums. Situated by the sea, 6 degrees south of the equator, it has tropical weather all year around. However, the humidity is definitely a shade lower than what we typically experience in Mumbai. The Indonesian people are friendly, courteous and patient. One example of this is evident in the crazy traffic jams – hardly heard any honking! English is not that well understood by the common man; so communication can be a bit of a challenge. Given the breadth and diversity of the country, many different cultures and languages exist. Jakarta itself is quite cosmopolitan. On the topic of language – the Bahasa Indonesian spoken by the majority of the population has many words with Sanskrit origin. It is an interesting blend of East-West, given that the script is Roman. Indonesia was a Dutch colony for over 3 centuries. But in comparison with cities like Mumbai, Kolkata, and Delhi – you don’t see as many colonial structures/infuence in Jakarta. Maybe the Dutch didn’t invest as much in infrastructure as the British. There are a few old buildings around the old port area and railway station – but nothing grand like the Fort Area or the Victoria Terminus in Mumbai. One prominent Dutch era remnant is the canal network in Jakarta. Though not very well maintained, they remind you of the typical Amsterdam canals. If there is any prominent western influence today, it is that of the American Culture – malls, fast-food, popular entertainment, etc. It was interesting to observe how Ramayan and Mahabharat occupy an important place in Indonesian culture. 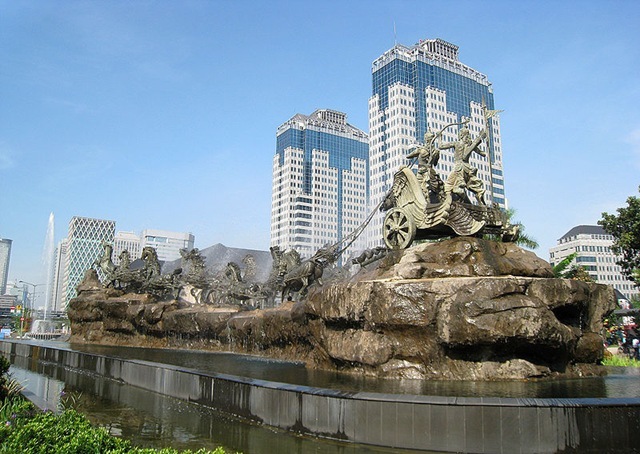 Jakarta’s central business district, features a prominent 50 feet long statue of Krishna and Arjun in a 13 horse chariot. Wooden puppets depicting scenes from these epics are quite popular. 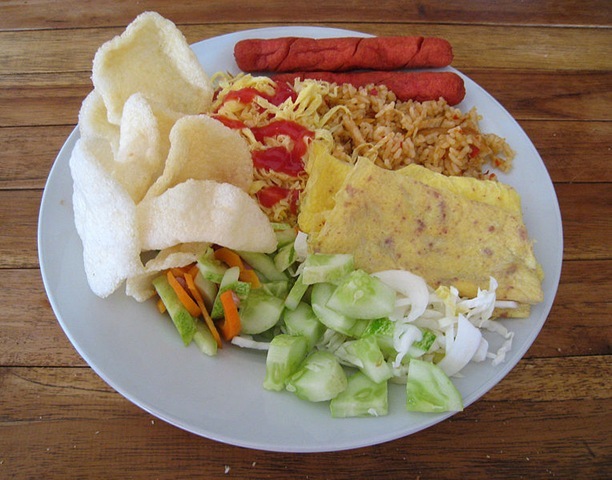 Nasi Goreng (literally means ‘Fried Rice’) is one of the most popular dishes in Indonesia. It is a spicy fried rice preparation with various additions such as Chicken, Seafood, Shrimp, Beef, Eggs, Vegetables, etc. It is available everywhere – from street-food corners to good restaurants. Traffic in Jakarta is crazy; but definitely better disciplined than in India. The city has over 2.5 Million Cars and over 7 Million Two-Wheelers. You will often get stuck in kilometers long traffic jams. Petrol is quite cheap (until recently, Indonesia was a net-exporter of petroleum) and public transportation is not very good. This adds to the traffic load. The highway infrastructure though is quite world class. Jakarta has quite a few expressways inside the city. The ride on the Jakarta – Bandung Expressway was also quite good. One interesting thing I saw was the concept of ‘tipping’ while yielding in traffic. In these crazy traffic jams, it is often impossible to make a turn in busy traffic. However an ingenious solution (doubt if it will work in India!) is often used to address this problem. A group of volunteers act as traffic cops, stop the oncoming traffic and let you pass. You simply tip this volunteer group! It is a commonly accepted practice…the oncoming vehicles doesn’t seem to protest! Toyotas ﻿﻿(and Daihatsus) are by far the most popular. The Toyota Innova (known as ‘Kijang’) and Toyota Avanza are the top models. These 3 passenger row vehicles are ideally suited for the large Indonesian families. 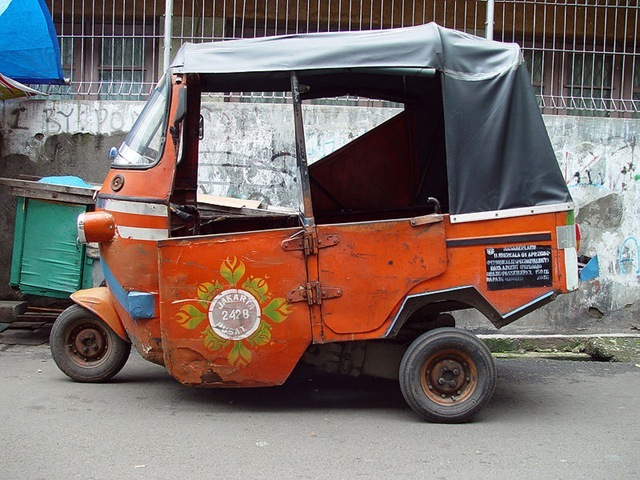 The iconic Bajaj Auto-Rickshaw made an entry in the Indonesian market in the 1970s. Though their popularity has gone down a bit since the 1990s, they are still omnipresent in Jakarta. Like in many Indian cities, they are popular commuting options. Interestingly, they are not called Rickshaws or Autos, but ‘Bajajs’! (Bajaj pronounced ‘Baa-j—aah’). One strange quirk though – the backseat appears to be at a substantial slant angle, compared to what we see here in India. We visited a few malls in Jakarta. Some of them were quite large and impressive – comparable with some of the good malls in U.S. Indonesia is definitely an attractive shopping destination; especially for apparel. Do make sure you visit the many traditional ‘Batik’ showrooms. Bandung is the 3rd largest city in Indonesia and also the educational and textile capital. 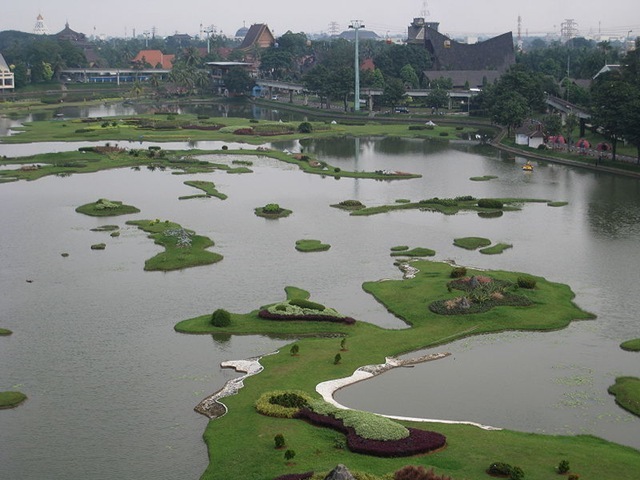 It is located around 160 km from Jakarta, at a height of over 800 meters. The weather is quite pleasant. Bandung is also a must-visit shopping destination for apparel. Many factory outlet stores have great merchandize selections and huge discounts. 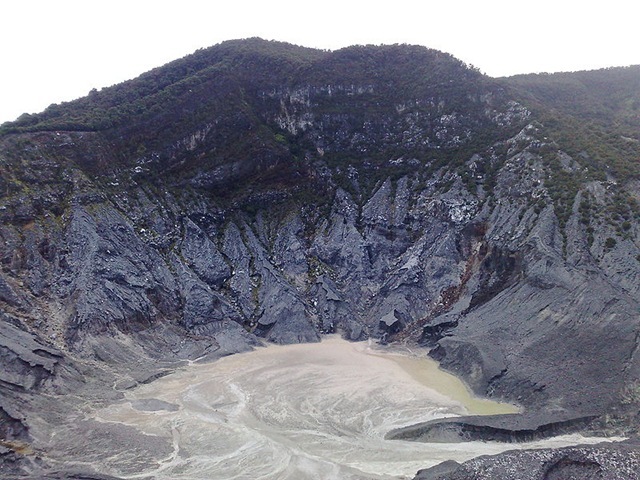 Located close to Bandung, ‘Tangkuban Perahu’ is a dormant volcano. It is a popular tourist destination. Tourists can do a short hike to one of the craters (Kawah Domas). This crater has a few active hot springs. Even though we didn’t visit Bali on this trip, we got a brief glimpse of the temples, architecture and culture at the park. Indonesia is the 2nd most bio-diverse country in the world (1st is Brazil). Given its vast expanse and tropical climate, a wide variety of plant and animal species thrive here. Dense forests, rice fields, cash crops plantations (palm, rubber, coffee, tea, etc.) fill up the landscape. Many different kinds of fruits grow here. Do recommend trying the pineapples here (they were great! ), as well as fresh coconut water (available everwhere!). Recently, I had a wonderful opportunity to visit the Netherlands. It’s interesting how you have an image in your mind about a place, a country – and then you see it for yourself for the first time. In my case, I can now say that I was fairly close. Netherlands has its series of attractions and icons: some extremely famous, and others not so much. In this brief blog, I will make an attempt to highlight some that caught my attention during this brief stay. I really enjoyed my time and look forward to making another trip. Netherlands is not exactly known for food, but I had a great culinary experience. I guess Ham & Cheese Sandwich is to Holland, what Fish & Chips is to Britain. I loved the great variety of breads,sliced meats and cheeses. Dutch pancakes were also quite terrific – different and a lot better than what you get in America. Apart from the traditional Dutch food, what struck me was the wide variety of eclectic global cuisine that was available in Amsterdam and other smaller towns. I expected to see a lot of Indonesian restaurants in central Amsterdam, but was really surprised to see a huge number of Indian restaurants there as well! There were Chinese, Middle-Eastern, Turkish, Argentinean and many other cuisines represented. In Europe, they serve great coffee. Even in a small town cafe, the Cappuccino was perfect. I guess this might be a problem for Starbucks to expand here. Our hotel ‘The Golden Tulip – Lisse’ located in a small suburb Lisse, about 30 km from Amsterdam, also had a famous 100-year-old restaurant ‘De Nachtegaal’ that served a variety of different dishes, ranging from Dutch Pancakes, to Italian Pastas and Thai Sateys. Bikes are one thing a first time visitor to Holland would expect; but the sheer numbers are astounding! Just look at the massive multi-storeyed bicycle-only parking lot next to the Amsterdam Central Train Station. Even in a small town like Lisse, you would see a swarm of bikes during the morning and evening rush hour. The riders include school kids from primary to high school, office goers, retirees, and from every other section of the society. Dedicated bike lanes definitely help and are clearly essential. Hotels (especially in suburbs) have bicycles available on rent. I was able to enjoy a nice 1 hour bike ride through Tulip country (No Tulips this time of the year!). Given the amount of bike riding the Dutch do, I wouldn’t be surprised if their overall health ranks much better than most other countries in the world. Windmills are probably the first thing that would come to mind when one thinks of Holland. They are not as omnipresent as one would think, but still you would see quite a few, especially in small towns. Many are not in a working state anymore, and a few have been converted into restaurants, galleries, etc. We had a nice dinner at one such restaurant ‘ d’Oude Molen ‘ (translates as: ‘The Old Mill) in a small town of Nieuw-Vennep. On expressway A4 leading south from Amsterdam towards Rotterdam, you do see some interesting contrasts of old windmills standing shoulder to shoulder with their modern airplane propellor like counterparts. Few cities carry such weight and seriousness in their name, as ‘The Hague’ (translated from ‘Den Haag’). But then this is a fairly unique place. The capital of the Netherlands, and the seat of many important international organizations – such as the International Criminal Court. I didn’t spend too much time there, but did drive around a bit. The palace (I only saw it from outside) is very impressive. The beach boulevard near the palace is a very popular place for tourists and locals. A large number of casual beach restaurants are a big attraction. I had a good lunch at Waterreus. This beach had an interesting historical photograph, prominently framed there. It showed the same view (with a lighthouse in the background – it is still there…) from 1944, with all the German fortifications – in preparation for defence against an Allied Landing. Given its capital and international diplomatic hub status, The Hague has a lot of dignitaries visiting and living there. While driving by some apartments, I noticed an interesting parking sign – ‘This Parking Spot Is Reserved For The Ambassador Of Guatamala’! I am not sure if they have similar reserved parking for every country’s ambassador (guess they should!) – it’s just that I saw only one such sign! Another extremely popular Dutch export is Heineken. I noticed that in Netherlands – many restaurants just serve one kind of beer: Draft Heineken. They have a nice museum in Central Amsterdam called ‘Heineken Experience’. I have been to the Miller Brewery Museum in Milwaukee (many years back) and found this to be a better experience. If there’s one type of structure all Dutch people need to be eternally thankful towards, it’s a ‘Dike’ (also referred to as ‘Dyke’ or ‘Levee’). These earthen structures protect the low-lying areas from raging sea waters. A large percentage of Holland is actually below sea-level (One data-point suggests that it is 27%). Schipol International Airport in Amsterdam is the lowest (11 feet below MSL (mean sea level) ) international airport in the world. For the past many centuries, the Dutch have been reclaiming land from the North Sea. Tulips are another classic attraction in Holland. I think this is especially the case amongst Indians – thanks to Bollwood. If one song caught the imagination of the Bollywood audience in the 1980s and created an everlasting impression of Tulips country – its ‘Dekha Ek Khaab …’ from Silsila (imdb link), staring Amitabh Bacchan and Rekha. Our hotel in Lisse was right in the middle of Tulip country. It was surrounded by vast Tulip fields and bike trails that run through them. Only problem was that we were at absolute right place, but not at the right time ;). Tulip season is in April-May. All we saw were mostly ploughed fields and small sections of some other flowers that grow during this time of the year. Central Amsterdam is beautiful. Canals, small streets, bicycle paths and footpaths blend in and coexist together. Old buildings (some over 400 year old) line these canals and streets. The Grand Central Railway Station building is quite imposing. Many refer to Amsterdam as a ‘walking city’. It’s not difficult to see why. The sheer number of people we saw in Central Amsterdam was huge. Yes, it was a weekend and the weather was nice – but still we heard from locals that this kind of crowd is not abnormal. If you think Manhattan is crowded, you should see this place! Clearly comparable with some of the crowded cities in India! The central part of Amsterdam has many tourist attractions – Shopping, Museums, The Famous Red-Light District Area, Canal Rides,..to name a few. I got an opportunity to see the Van Gogh Museum. I am not much of an art lover so its best that I don’t attempt to describe any of his famous works! Rembrandt Museum is also close by in the Museum District. I can recommend 3 good ways to checkout Central Amsterdam – I tried all of them. A canal cruise is a must as it takes you around the complex network of waterways around the city and gives you a nice close-up view of some of the great historical buildings. It was interesting to learn how all those old buildings are built on a 40 (or 60) wooden pillars foundation. Due to some structural problems that have arisen over the years (I must say the construction is good – since many have been around for 3 or more centuries! ), a few buildings are tilted. (See the above photo of the famous ‘Tilting House’). If you have extra time on hand, and the weather is good – walking is probably the best way to see the city. The third way is less exciting, but the most efficient. Just buy a 7 Euros daypass (I bought it at the Central Station Tourist Office – but I am sure it must be available elsewhere) and you can roam around Amsterdam on any of the Trams and Busses. We found the Dutch people to be warm and friendly. However, didn’t have a great experience when asking for directions 😉 On atleast 2 occasions, we were confidently sent on a wrong detour (that resulted in us driving around for over 1 hour..) to reach our hotel, that was just a few km away. And English was not the problem! I know its typical European to have shops close in the evening, and remain closed on Sundays. But this still takes getting used to, if you are coming from U.S. or India. I always wonder what the locals do if there’s any emergency shopping need. Amsterdam Grand Central Station has a Tourist Information Office. I got there at 10:30am, only to find a huge line outside. Turns out that this place only opens at 11am. There were many irritated tourists from all over the world here. Netherlands is a great place to visit. Being a small country neighbouring U.K. and Germany – it has influences from both. English is more prevalent here compared to many other continental European Countries. It is also home to some leading multi-national companies such as Phillips, Royal-Dutch Shell, Unilever, ABN Amro,ING, etc. I spent most of time in and around Amsterdam. I am sure the other cities like Rotterdam, Eindhoven will have their own sets of nice attractions. Netherlands is a great confluence of history and nature. Nice, green modern cities. Beautiful, quaint small towns. The landscape changes significantly as one drives East from Amsterdam towards the German Border. I didn’t get a chance to visit the Northern Netherlands – home of the famous Dutch Cheese. Well, something for my next trip!